YouTube is not only the largest video collection website but also offers a simple video creator tool for converting your photos into a beautiful video with transitions and effects. Videos created can simply downloaded and used in your site or you can use the YouTube video sharing link without downloading the video. 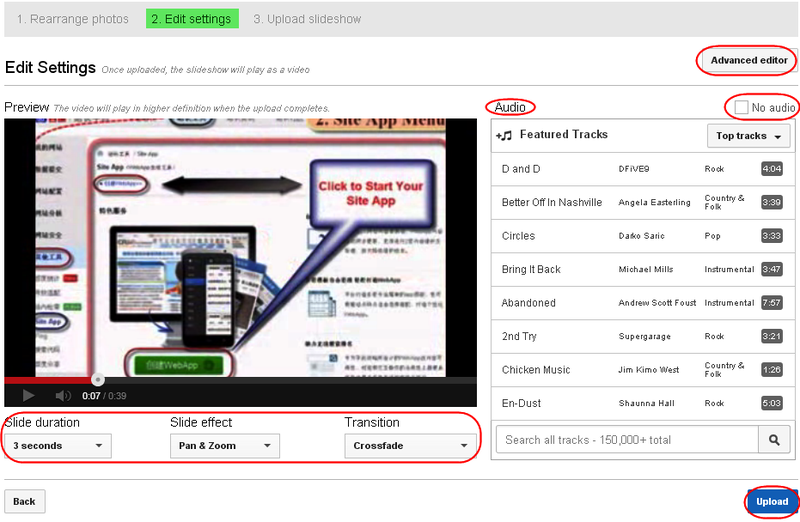 This article explains step by step process of creating a video using YouTube video creator tool. You should have a valid login account in order to create a video with YouTube. Your Gmail account can be used for logging into your YouTube account and you don’t need to create a new account. Once you logged into your YouTube account, click on the “Upload” button as shown in the picture beside. You have many uploading options and click on the create button under “Photo slideshow” option to start uploading your photos. 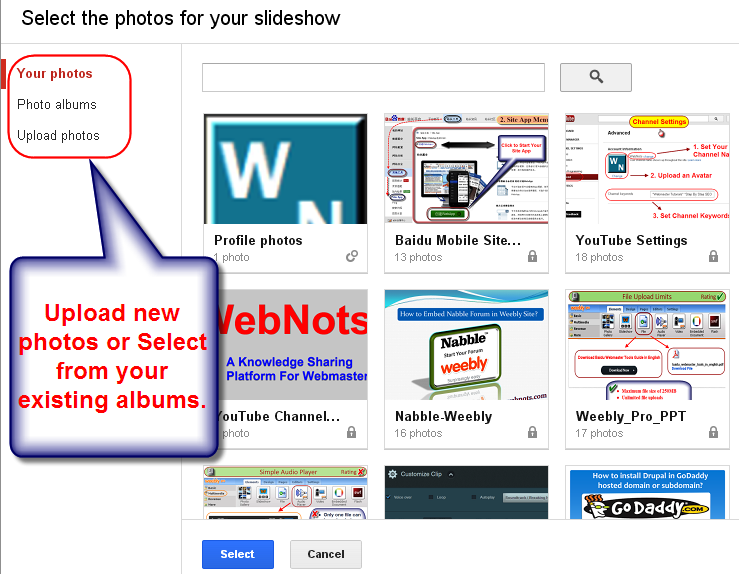 When you click on the create button the step1, there will be a new window open asking you to choose the photos for your slideshow as shown in the below picture. You can either upload new set of photos or choose the images from your existing albums and click on “Select” button. Once you uploaded the photos, you have the options to rearrange your photos in the any order, delete photos from the list and add additional photos to the existing list. Once you arranged your photos then click on the “Next” button. Under “Edit settings” tab you have various customizing options for choosing the slide duration, slide effect and transition. Choose “No audio” check box if you don’t want to add audio to your video otherwise you can choose any free audio from the track list. Click on the “Upload” button to start uploading your video or click on the “Advanced editor” button to see more customizing options for your video. Advance editor as shown in the below picture offers various options to add text, audio and transition effects to your video. 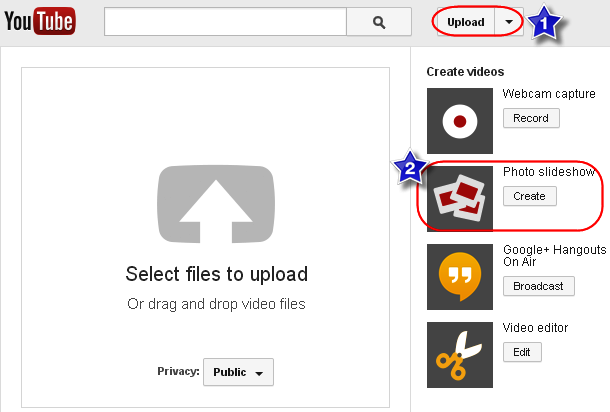 Once finished with your customization then click on the “Publish” button to start uploading your video into YouTube. 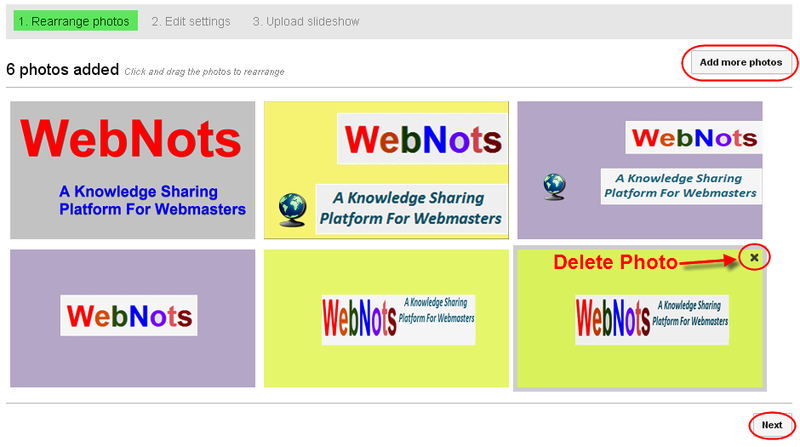 In the Advanced editor click on the individual slides to see more options applicable for that particular slide. For example, you can change the contrast and brightness, rotate your image and auto-fix it for best viewing. Any changes you do will be immediately reflected in the preview video. You also have an option to view the original video along with the modified video side by side to check the effect of the modification. During the upload process you can provide the details under Basic info, Monetization and Advance settings tab. 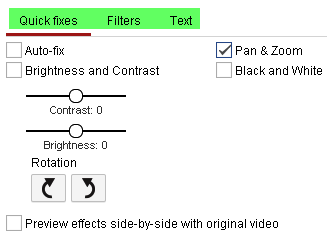 You can also provide or change these details anytime after your video is uploaded into YouTube. 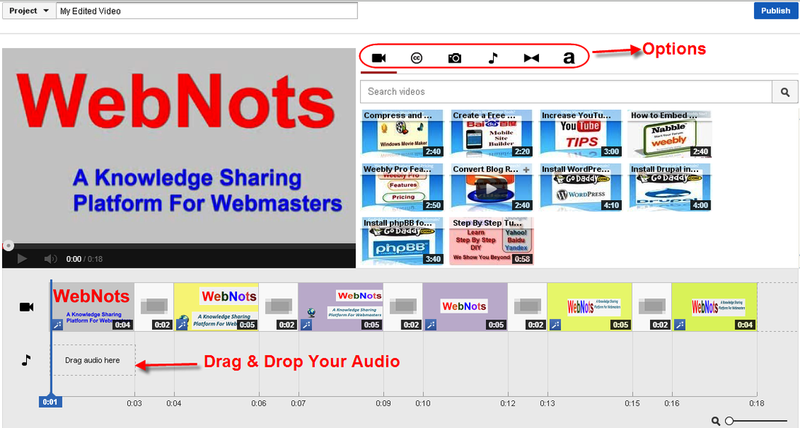 Provide video title, choose an attractive thumbnail and choose sharing options under “Basic info” tab. If you are a YouTube partner or having an AdSense account then you can monetize your video. “Advanced settings” tab allows you to choose video embedding and subscriber notification options. Download your video anytime from Video Manager just by clicking the down arrow near to the “Edit” button and selecting “Download” option. AdSense account is not mandatory for becoming a YouTube partner but your YouTube earnings will ONLY be paid through your AdSense account. Choose an attractive thumbnail which will be shown to all the users and in the search engines along with the title and description of your video.